Anyone who meets Hemanth would find it hard to say goodbye. He is a happy baby who always smiles and lights up the room. It is hard to feel anything negative around him. I think God gave him a gift, the power to make others happy. He's been using it on all of us since the day he was born. That smile, which makes everyone else's pain fade away, somehow does not make his pain go away. My baby boy was born with a terrible disease called HLH (Hemophagocytic Lymphohistiocytosis). His immune system is very weak, and even a common cold can take him away from me. 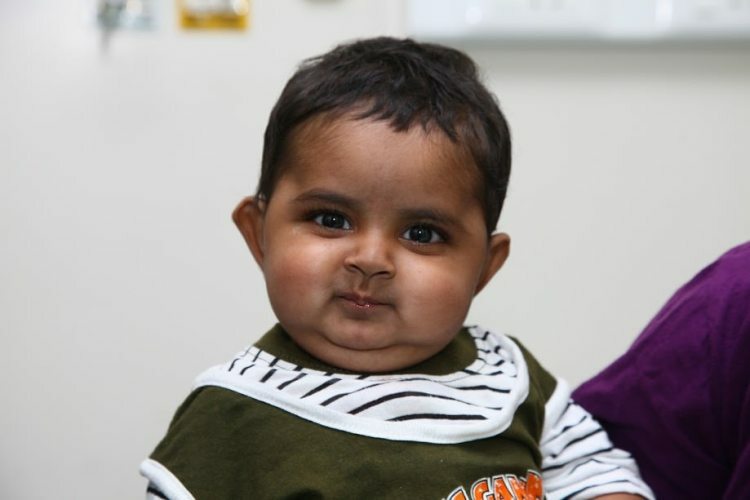 When I got pregnant with Hemant, I knew exactly what he would look like, be like. Our first child, a daughter, was also the same. There's never been a day in her life that she was not smiling, except for the final moments of her life. She was also born with this disease, and we lost her to it in just 6 months. We then had a baby boy. Satwik is 3 now, and he could not contain his excitement to play with a little sibling. Since Satwik was healthy, I never had a reason to think Hemanth would be sick. In November, fate gave us the worst blow. Hemanth was born on our wedding anniversary. We could not have been happier. In November, he started falling sick very often. It did not seem serious at first, but when the fever persisted, I had a very familiar sense of dread creep over me. Ramanju and I took him to the doctor hoping we were wrong. Hemanth was diagnosed with an immunodeficiency disorder that makes too many activated immune cells. This makes it difficult for his body to protect him from any infections that threaten him. It took us years to find the strength to move on from the loss of our daughter. We thought, she came back to us in the form of Satwik or Hemanth. We see her in their smiles. Now, with Hemanth's body giving up on him, I feel like I'm losing my child all over again. People who look at Hemanth would never guess that he is sick. In fact, even at the hospital, every week when he is being poked and prodded by needles, my son does not cry. The doctors and nurses are surprised as they have never seen anyone this strong, leave alone a baby. This is why it is hard to accept. There are no visible symptoms. He is the picture of health and happiness, but from within, his body is failing. His liver and spleen are enlarged, and with every passing moment, he is slipping away from us. 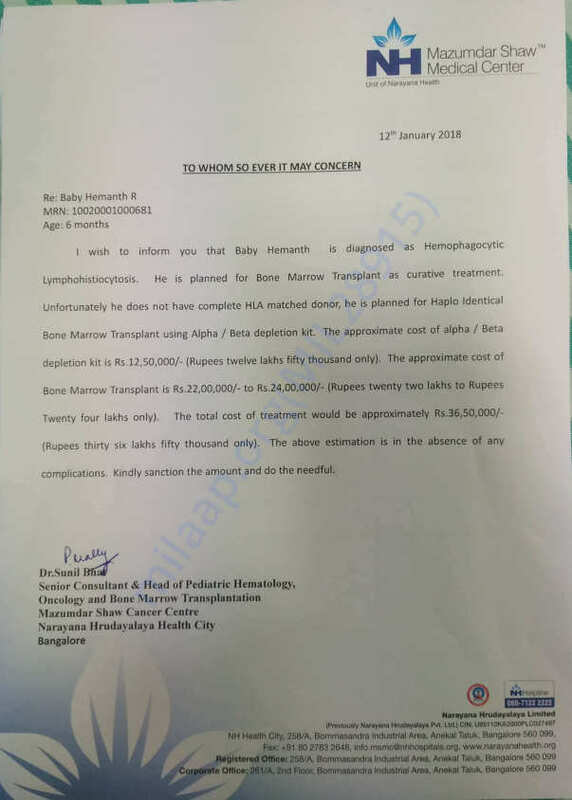 Hemanth needs a bone marrow transplant to live. My husband, Ramanju is a vegetable seller, and I Hemvathi occasionally work as a tailor. We felt rich with the happiness we have had in the family. The treatment will cost us Rs. 36 lakhs and if we cannot afford it, we have to stop the treatment. It is as good as giving up on our son. I cannot do that. My son does not deserve to die because of money. Please help us save him. Hemanth has been living with a life-threatening immunodeficiency disorder for months now. He is highly susceptible to infections. The only thing that can save him is a bone marrow transplant. 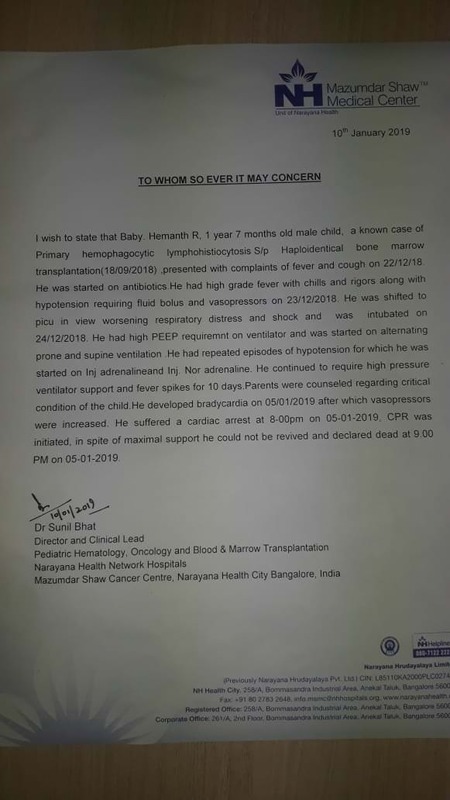 Despite the pain and suffering, baby Hemanth hasn’t given up. He continues to spread joy and happiness wherever he goes. However, his parents' meagre income is not enough to cover the 36 lakhs needed for his treatment, and they're now struggling to save him. 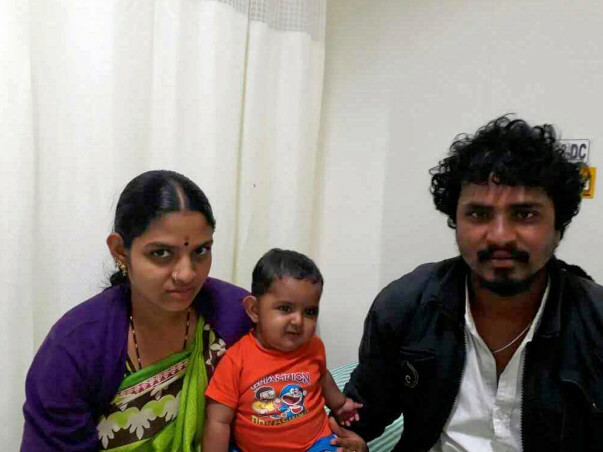 Your support can save baby Hemanth's life. As mentioned in the previous update, Hemanth-r is no more with us. 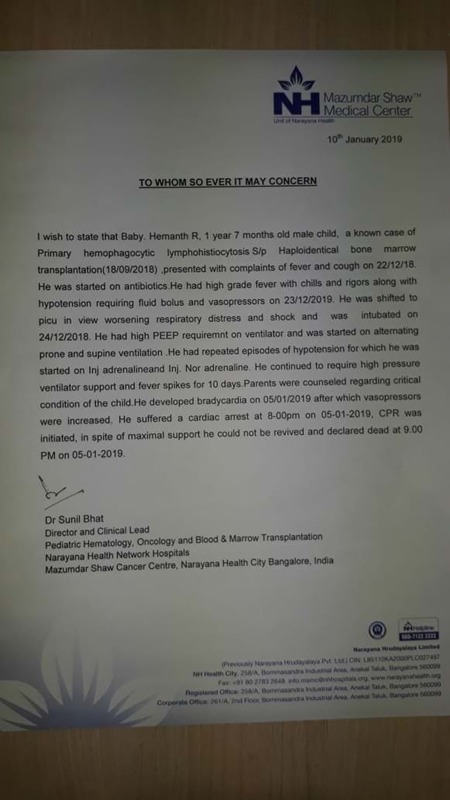 He underwent his transplant in September post which, in December Hemanth was admitted in PICU and was on ventilator for Respiratory Distress. He suffered a Cardiac Arrest post which his health deteriorated and despite on maximum medical and para medical efforts he couldn't survive. All the funds raised will be utilized to clear his medical expenses. Please find attached letter provided by the hospital. Errata: He had high grade fever with chills and rigoros along with hypotension requiring fluid bolus and Vasopressors on 23/12/2018. Hemanth is no more with us. Hemanth was undergoing his treatment but his health deteriorated and he couldn't make it. Hemant you will be alright don't worry.